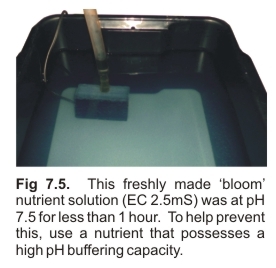 A high pH buffering capacity in a nutrient is an advantage. It ensures minimal initial and ongoing pH adjustments are required, especially where high alkalinity make-up water is used. This feature is extremely beneficial because a lack of pH control is a common cause of nutrient failure and plumbing blockages (Fig 7.5). As a rule-of-thumb, a high quality ‘bloom’ formulation should require virtually no initial pH adjustment, even when used with high alkalinity water. This means that after dilution with a range of make-up waters, the pH should always fall well within the range 4.5 to 6.5. However, many brands fail to offer this feature.